In the heart of Milan, just steps from the Duomo and the Galleria Vittorio Emanuele II, this modern elegant townhouse offers a quiet retreat from the bustling city. Ideal for both business and leisure travel, you are within walking distance or a short tram ride to all parts of the city. So many sites are within walking distance- a10 minute walk will allow you to climb the top of the Cathedral's Gothic spires roof top where you will be among 3,600 statues. Afterwards cross the piazza del Duomo to one of the world's oldest shopping arcades. The galleria Vittorio Emanuele II – with its thousand yard long glass roof streaming a cerulean blue light every evening, no matter what the weather. It's the place where the Milanese and visitors shop for the finest - from Prada to Gucci to Louis Vuitton in between shopping stop for lunch at the Ristorante Biffi, whose been at the galleria since it's opening in 1867. For Armani, Prada, Versace, Dolce e Gabbani a 15 minute walk or 25 minute taxi ride you will reach the Quadrilatero della Moda - "the golden triangle' the heart of the fashion industry and the Milan's most famous shopping streets. From your townhouse you are just a 10 minute walk to La Scala, making for a nice leisurely stroll home after the opera , 1 minute walk to the Santo Maria presso San Satiro and the Ambrosian library, 14 minutes to the Brera museum. The townhouse Milano has been completely restored with a contemporary flair. Designer ceiling lamps and the floor lights lend a warm atmosphere to the house during the evening hours. 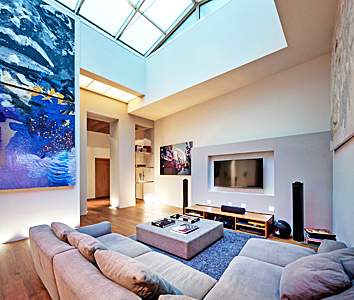 The owner's contemporary art collection adorn the walls in museum-like display yet keeping the house warm and inviting. The ground floor makes up your private spa – with dry and steam saunas, 6 person Jacuzzi and a mediation room. The first floor holds the living areas, includes a spacious open living room with partial glass ceiling, large flat screen TV with DVD and CD players, two dining areas and two wood decks, one in the living room and the other reached from the kitchen has a table and benches for additional dining, and glass covered ceiling. The professional kitchen is outfitted with the state of the art appliances, including microwave, oven, double door refrigerator, 5 burner stove top and stainless steel counters, and flat screen wall mounted TV. Wine cellar, guest bath, staff room with laundry facilities, and the first en suite bedroom with two single beds that can be joined on request, has a walk in shower. The upper bedrooms are reached by private elevator or staircase. The Master bedroom takes up the entire second floor, the king bedroom's en suite bath is reached via a hallway with large closet, and has freestanding tub. A mezzanine area over the king bed is reached by a short set of stairs and can become your office if needed, with a Lucite desk and extra closet space. The third bedroom is the smallest, but just as comfortable, with King en suite bedroom with shower and walk in closet.